Outstanding trees and shrubs appropriate for growing in the Delaware Valley are displayed in seven Featured Collections in the Kendal Crosslands Arboretum. These collections demonstrate how botany, horticulture, and landscape design can be successfully combined and in the process, educate residents and visitors to the Arboretum. 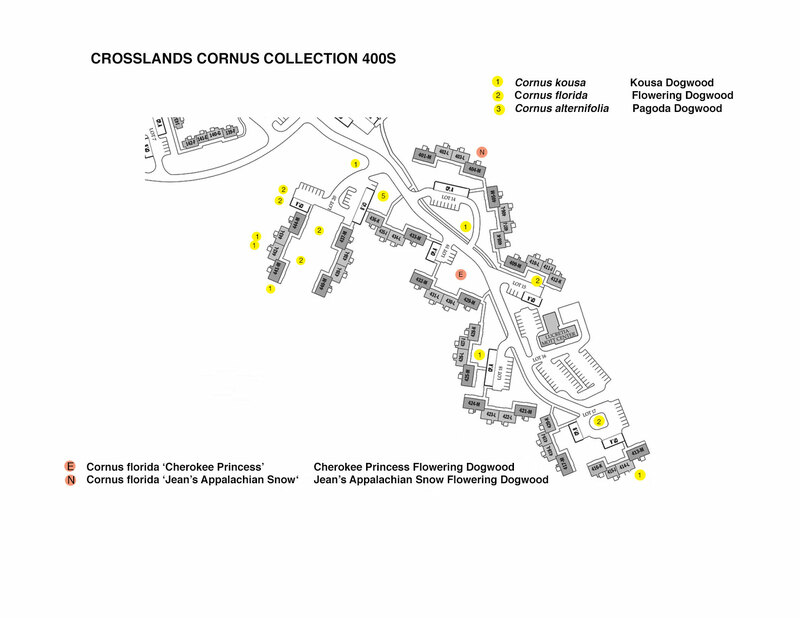 The Featured Collections showcase four genera – Magnolia, Quercus (oak), Cercis (redbud), and Carya (hickory) on the Kendal Campus and four genera -- Magnolia, Cornus (dogwood), Hamamelis (witchhazel), and Ilex (holly) on the Crosslands Campus. 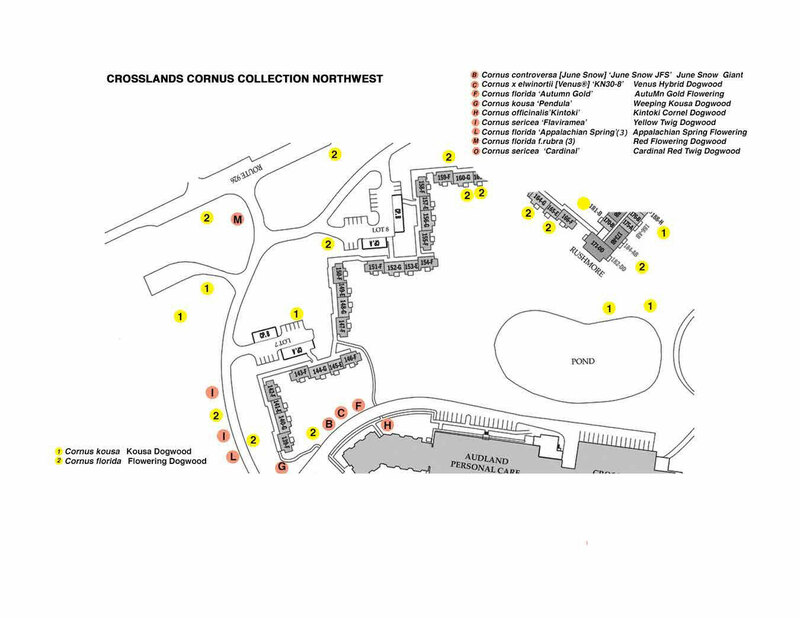 Collections allow one to compare different species within a single genus, to assist the surrounding community in determining the appropriate plants for their landscape plans, and to provide an attractive landscape for Kendal Crosslands residents. Plants in the Featured Collections offer many attractive features, whether it is a flowering and fragrant tree in spring, soothing green foliage for shade in summer, colorful leaves and fruit in fall, or an architectural silhouette against the stark winter sky. Additionally, trees provide food and shelter for wildlife. Although many of the trees are newly planted, they represent gifts for future generations to study and enjoy. Worldwide, magnolias are cherished above all for their flowers. Growing as large shrubs or stately trees, they produce showy, fragrant blossoms that come in colors of white, pink, red, purple or yellow. While the flowers receive most of the attention, many magnolias also produce highly ornamental fruit – a prominent, cone-like structure decorated with shiny orange-red seeds. Some species are evergreen with glossy, leathery leaves and some evergreen types have buds, stems, and leaf undersides covered with attractive, coppery brown, felt-like hairs. Named after the French botanist Pierre Magnol, this ancient tree belongs to the genus Magnolia and is a member of the Magnolia Family (Magnoliaceae). There are more than 200 species of Magnolia native to the temperate, subtropical, and tropical regions of southeastern Asia, eastern North America, Central America, the Caribbean, and parts of South America. Depending upon the species and the hardiness zone one lives in, somewhere a magnolia will be in bloom every month of the year. Magnolia flowers are borne solitarily and composed of 6 or more petal-like tepals. Unlike most other flowering plants where the petals and sepals are clearly differentiated, in magnolias these two floral parts are fused together and called tepals. The tepals are the showy parts of the flower, arranged in whorls of two or more. Beetles are the primary pollinators of magnolia flowers, in part because magnolias evolved long before bees and other flying pollinators were present on earth. The flowers do not produce nectar but produce large quantities of pollen which is high in protein and is an excellent food source for beetles. When pollinated the magnolia seed pods, resembling exotic-looking cones, split open to reveal shiny, orange-red seeds. The seed is surrounded by a brightly colored, fleshy aril that is high in fat and relished by songbirds. This fleshy covering provides migrating birds with a beneficial source of energy as they migrate south. Evergreen species of magnolia also provide shelter for birds and wildlife that stay north for the winter. There are several excellent books about magnolias including The World of Magnolias by Dorothy J. Callaway (1994), Magnolias: A Gardener's Guide by Jim Gardiner (2000), and more recently The Plant Lovers Guide to Magnolias by Andrew Bunting (2016). Additional information on magnolias may be found on the Magnolia Society International website, www.magnoliasociety.org. 1. Evergreen Magnolias. The word “magnolia” immediately brings to mind our native Magnolia grandiflora, the iconic, stately Southern Magnolia with its large, deep green, glossy leaves and huge, fragrant, white blossoms – the state flower of Mississippi and Louisiana. Few trees rival it for year-round beauty. However it does have its drawbacks – both its shallow root system and the dry shade it creates make it difficult to garden beneath, and its large, leathery leaves drop continuously throughout the year creating a messy look. M. grandiflora grows well in sun to part shade and in well-drained soil; it is hardy from New York City southward to Florida and westward to California (Zones 6-10). More cold hardy than the Southern Magnolia is another native, the Sweet Bay Magnolia (Magnolia virginiana var. virginiana, Zones 5-9). This is a smaller tree that is easier to fit into most gardens and is found growing along the eastern Coastal plain from Massachusetts to North Carolina. Though considered deciduous in its northern range it is evergreen in its southern range. There is also an evergreen form, Magnolia virginiana var. australis (Zones 6-10), native from South Carolina south to Florida and west to Texas. Flowers of both varieties are creamy white with a lemony fragrance and when the wind blows, the silvery undersides of the deep green leaves “twinkle” ornamentally. Sweetbay Magnolia performs well in full sun to full shade and thrives in normal garden soils as well as in marshy, wet ones. 2. Deciduous Magnolias with Saucer-like Flowers. This group includes the ever popular and most widely planted magnolia, the Saucer Magnolia (Magnolia ×soulangeana, Zones 4-9). Also called the tulip tree reflecting the shape and bright color of its flowers that come in various shades of white, pink, rose, purple, magenta, and burgundy, this French hybrid (Magnolia denudata x Magnolia liliiflora) was developed in the early 1800s. Saucer magnolias prefer fertile, acid, well-drained soil and they do not tolerate heavy wind or salt spray. Unfortunately early-flowering selections are prone to frost damage. Related to these, but also less tolerant of winter cold and summer heat, is the spectacular magnolia from western China – Sargent’s Magnolia (Magnolia sargentiana, Zones 7-9). Though their early flowers may fall victim to late freezes, one spring season with untouched blooms will quickly make one forget the disappointments of years past. The size and the abundance of their huge, bubblegum pink flowers will weigh down the tree. The Goddess Magnolia (Magnolia sprengeri var. diva, Zones 5b-8), also native to China, flowers late enough to escape frosts and is considered the most beautiful of all magnolias displaying deep rose flowers on the outside and a streaked pale pink on the inside. In its own category is the Oyama Magnolia (Magnolia sieboldii, Zones 5-9), a native to South Korea, southern China, and Japan where it grows as an understory plant and bears nodding, saucer-shaped, fragrant blooms after the leaves emerge. The pure white flowers have an attractive central cluster of deep maroon stamens. Commonly grown in Japanese tea gardens, this multi-stemmed shrub grows in full sun to full shade in any well-drained soil. 3. Deciduous Magnolias with Star-like Flowers. This group includes the Kobus Magnolia (Magnolia kobus, Zones 5-8), the Star Magnolia (Magnolia stellata, Zones 4-8) and a hybrid between these two, the Loebner Magnolia (Magnolia ×loebneri, Zones 4-8). All three are cold-hardy, heat-tolerant, and very adaptable plants, however late frosts may sometimes damage their early blooms. Very adaptable, they grow well in full sun and in a well-drained soil and are surprisingly wind resistant. Magnolia kobus is native to Japan and South Korea where it grows as a tall, upright species. Flowers are usually white sometimes pink with tepal numbers ranging from 9 to 12. Native to Japan and mostly shrub-like and multi-stemmed, Magnolia stellata is among the earliest of the magnolias to bloom with flower colors ranging from white to many shades of pink. The blossoms occur in great numbers and are extremely showy due to the large number of tepals per flower, ranging from 12 to 40. Since Magnolia ×loebneri is a vigorous hybrid between the above two species, many cultivars have been developed from this cross, resulting in a diversity of habits (single-stemmed to multi-stemmed), flower colors (white to lilac purple), and tepal numbers, 8 to 30. 4. Large-leaved, Native Magnolias. Less widely planted, but deserving of greater attention, is a group of large-leaved, native magnolias generally used as bold accents or shade trees. They can be found growing along the East Coast southward to the Florida panhandle, in the southern Appalachian Mountains, and westward to Arkansas and Louisiana. These magnolias grow best in moist, organically rich, well-drained soils in full sun to part shade and are generally intolerant of soil extremes (dry or wet). Protect from strong winds which may shred their large leaves. Hardy in Zones 5-9. Cucumber Tree (Magnolia acuminata) and its smaller sibling, the Yellow Cucumber Tree (Magnolia acuminata var. subcordata) are the source of the yellow flower color of the many new hybrids with tulip-shaped, golden yellow blossoms. Brooklyn Botanic Garden was instrumental in the creation of the so called “yellow magnolias” incorporating the Cucumber Tree (Magnolia acuminata), the Yulan Magnolia (Magnolia denudata), and/or the Lily Magnolia (Magnolia liliiflora) into these hybrids. The Bigleaf Clan – Bigleaf Magnolia (Magnolia macrophylla), Umbrella Magnolia (Magnolia tripetala), Fraser Magnolia (Magnolia fraseri), Pyramid Magnolia (Magnolia fraseri var. pyramidata) and Ashe Magnolia (Magnolia macrophylla var. ashei). These are medium-sized trees with huge leaves and large flowers that appear as/after the leaves unfurl. Magnolia macrophylla var. dealbata is the Mexican sister of big-leaved forms and is commonly called the Cloudforest Magnolia. 5. Hybrid Magnolias. Hundreds of hybrid magnolias have been developed over the past 200 years providing magnolia lovers with a wide range of floral characteristics (color, size, and fragrance) and plant habit (size, shape, and hardiness). The first hybrid dates back to 1820 when French botanist Etienne Soulange-Bodin hybridized M. denudata with M. liliiflora to create the world-famous Saucer Magnolia, M. ×soulangeana; it has become the most widely cultivated group of magnolias today. In Germany in 1914 the Loebner Hybrids were produced by crossing M. stellata with M. kobus, giving us the very hardy, multi-tepaled blooms of ‘Leonard Messel’ and ‘Merrill’. Another milestone occurred in mid-1950s when the U.S. National Arboretum crossed M. stellata with M. liliiflora and created “The Little Girl Series” – affectionately known as “The Girls” (Magnolia ‘Ann’, ‘Betty’, ‘Jane’, ‘Judy’, ‘Pinkie’, ‘Randy’, ‘Ricki’, and ‘Susan’), a magnolia perfect for the smaller garden. The quest for Yellow Hybrids occurred at the Brooklyn Botanic Garden, NYC starting in 1956 and spanning over some 40 years. M. denudata was crossed with M. acuminata, producing the first yellow magnolia, ‘Elizabeth’. Shortly thereafter the American species (M. acuminata) was crossed with an Asian species (M. liliiflora), producing ×brooklynensis which paved the way for such cultivars as ‘Hattie Carthan’, ‘Evamaria’, and ‘Woodsman’. Since the late 1980s an explosion of hybrids has occurred -- finding their way into gardens and landscapes around the world and leading the way for magnolias to become one of the most popular genera to grow and love. 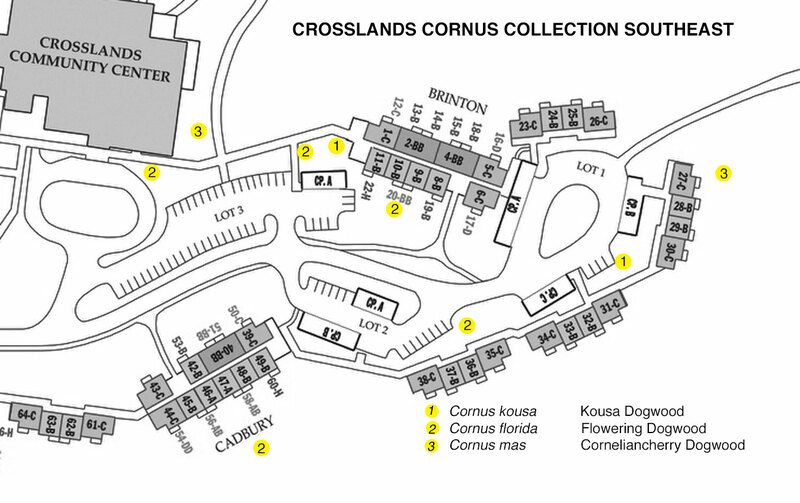 The Magnolia collection is located on the Kendal and Crosslands Campuses. 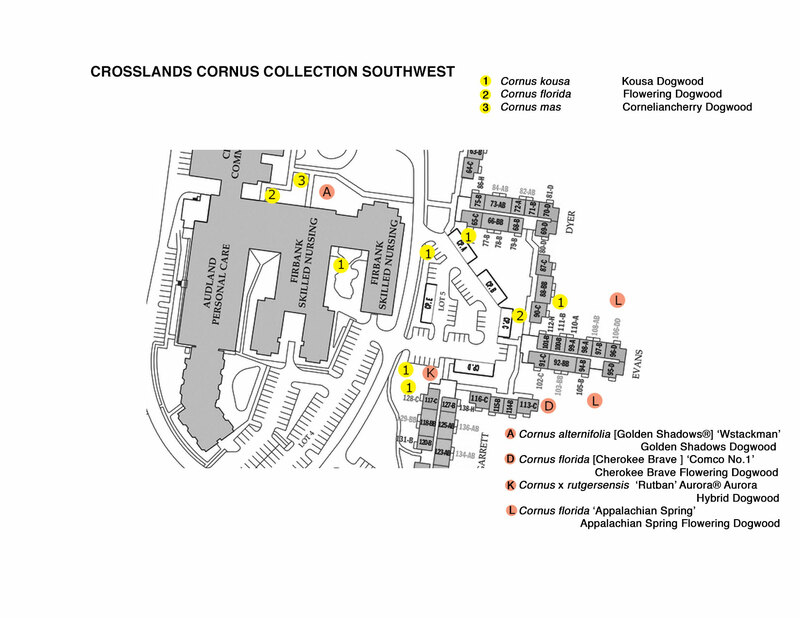 There are 49 trees representing 25 taxa on the Kendal Campus and 33 trees representing 13 taxa on the Crosslands campus. The total for both campus is 82 trees representing 32 taxa. 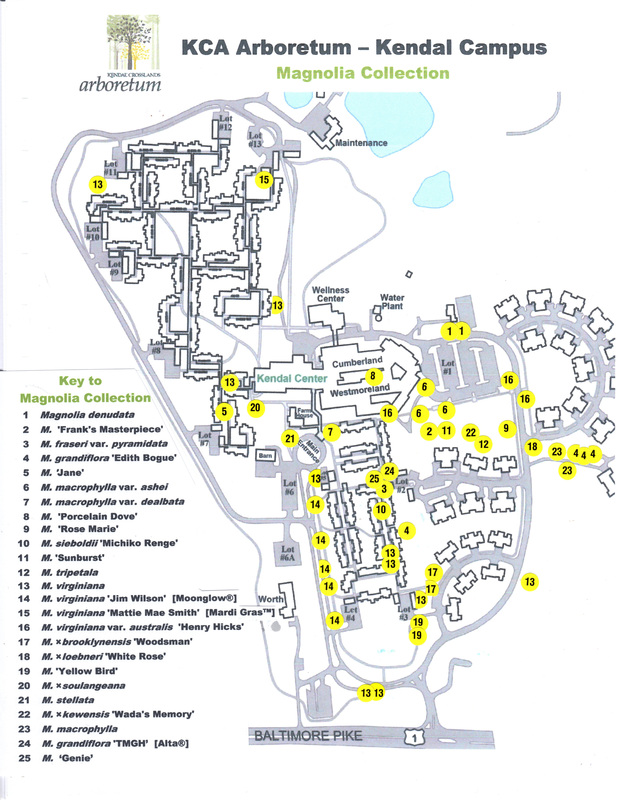 There are 6 taxa duplicated on both campuses. A detailed description of each of the 32 taxa listed below can be accessed by clicking on the botanical name. Maps showing actual locations on two separate maps can be accessed by clicking on the map name under the heading "Campus Location." Nothing symbolizes spring more than the sight of a flowering dogwood. Native to eastern United States, Cornus florida is dearly loved for its large, white or pink inflorescences that blanket the tree just before the leaves emerge. After the blossoms fade, this small to medium-sized tree continues to enhance the landscape with its horizontal branching pattern, softening the edges of our homes. Bright red fruit and burgundy-colored leaves signal the arrival of fall, and in winter the bare branches become living, architectural statuary in the stark landscape. Cornus florida is just one of a number of species in the genus Cornus. According to Paul Cappiello and Don Shadow in their book “The Genus Cornus, Dogwood”, the number of species ranges from 45 to 65 with 15 native to North America. In addition, new interspecific hybrids have been developed and introduced. The species range in size from the creeping, low-growing, herbaceous groundcover (C. canadensis), to colorfully multi-stemmed shrubs (C. alba, C. sericea, C. sanguinea), up to 30 foot-tall trees (C. florida, C. kousa). The small flowers may be arranged in flat-topped cymes (C. alternifolia, C. sericea) or surrounded by large, ornamental, petal-like bracts (C. florida). Cherished by wildlife, the rounded, colorful berries are displayed in hues of red, white, blue, or yellow. Finally for dramatic fall foliage the dogwoods are hard to beat, ornamenting the landscape in shades of burgundy, red, and orange. Dogwoods are primarily deciduous and have simple, untoothed leaves with distinctive veins that curve parallel to the margins (edges). Most dogwood species have opposite leaves, while a few, such as C. alternifolia and C. controversa, have their leaves alternately arranged. In many species the flowers are borne separately in open clusters, while in other species, such as C. florida, the very small, yellow flowers are tightly clustered and surrounded by four, large, white or pink, petal-like bracts. The bark, especially those shrubs (C. alba, C. sanguinea, C. sericea) known by the color of their stems (yellow, red, orange, or coral), provide identification and winter landscape ornamentation. C. florida bark matures into grayish brown to blackish blocks while the mature bark of C. kousa exfoliates into a mosaic of tans, pinks, and grays. In winter against a snowy background, the bark of C. kousa is highly ornamental. The fruits of all dogwood species are drupes that contain one or two seeds, are often quite colorful, and a few are quite tasty. C. kousa and C. mas are sold commercially as edible fruit trees. The fruits of C. kousa have a sweet, tropical pudding-like flavor in addition to hard pits while the fruits of C. mas are both tart and sweet when completely ripe and are very high in Vitamin C. For centuries they have been eaten in Eastern Europe both as food and medicine to fight colds. However the fruit of the shrubby species is mildly toxic to people, though readily eaten by birds. The native dogwoods are a favorite food source of the larvae of 118 different species of butterflies and moths. Most dogwoods are reasonably tolerant of diseases if given minimal care and appropriate siting. Most will grow well in slightly acidic garden soil that is well-drained yet contains some moisture during hot and dry summers. Stem canker can be a problem in the ornamentally barked shrubs such as C. alba and C. sericea as well as C. alternifolia so it is best to keep those shrubs minimally stressed. A breeding program at Rutgers University under the direction of plantsman Dr. Elwin Orton began in 1965 with the goal to develop novel cultivars of Cornus florida and C. kousa as well as interspecific crosses between the two. 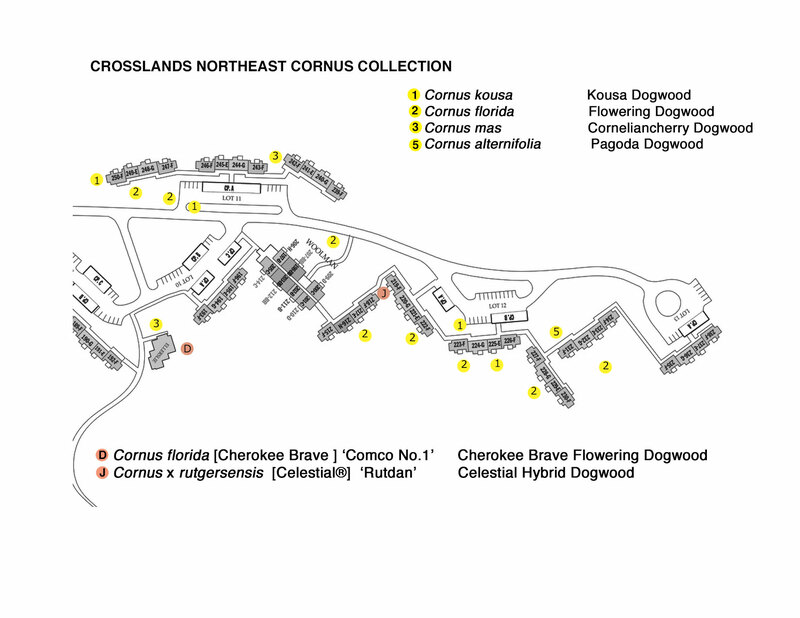 The birth of these improved dogwoods arrived in the early 1980s and the first six patented cultivars, botanically named Cornus x rutgersensis and known as the Stellar Series®, were Aurora®, Celestial®, Constellation®, Ruth Ellen®, Stellar Pink®, and Stardust®. They exhibited excellent hybrid vigor and disease resistance toward the growing threat of anthracnose. Two newer Rutgers’ introductions, Venus® and Starlight®, arose after Dr. Orton introduced the West Coast native, Cornus nuttallii, into his breeding program. These hybrids are listed botanically under Cornus x elwinortonii. The destructive pathogen of the 1970s however has been the dreaded dogwood anthracnose caused by the fungus Discula destructiva that spread rapidly through populations of our native flowering dogwood, C. florida. The C. florida cultivar, ‘Appalachian Spring’, was selected in the early 1990s specifically for its resistance to dogwood anthracnose. Ironically it was found growing in the Catoctin Mountains of Maryland near the Camp David presidential retreat, an area where dogwoods had been decimated by the disease. The next serious threat to the flowering dogwoods occurred in the 1990s when powdery mildew (Microsphaera corni) arrived on the East Coast. Consequently powdery mildew resistant cultivars (‘Jean’s Appalachian Snow’, ‘Karen’s Appalachian Blush’, and ‘Kay’s Appalachian Mist’) were released in the early 2000s by the University of Tennessee’s Agricultural Experiment Station. The genus name comes from the Latin word cornus meaning horn in reference to the strength and density of its wood. The common name, dogwood, is in probable reference to an old-time use of the tree’s hard, slender stems for making skewers once known as dags or dogs. 1. Big-Bracted Dogwoods (Cornus florida Group) – characterized by having large, petaloid bracts (a modified leaf that resembles a petal) that surround a compact cluster of flowers; red fruit occurs in clusters. This group includes our eastern North American species (C. florida), our western North America species (C. nuttallii), and a species from eastern Asia (C. kousa). 2. Non-Petaloid-Bracted Dogwoods (Cornus mas Group) – possess flowers surrounded by four, non-petaloid bracts (bracts that do not resemble petals) that are arranged in an umbel; oblong fruits appear in clusters and are red or purplish black. This group includes our western North American species (C. sericea), a species from Europe (C. mas), and several from eastern Asia (C. officinalis, C. chinensis). 3. Bractless Group (Cornus alba Group) – characterized by showy white flowers that do not possess modified or petaloid bracts; flowers are arranged in branched clusters; the clustered fruits are white, blue, or black. This group includes a species from eastern North America (C. amomum), from eastern Asia (C. controversa), and from eastern and central Asia (C. alba). 4. Dwarf Group (Cornus canadensis Group) – characterized by having minute clusters of true flowers surrounded by four, ornamental, petaloid bracts. C. canadensis is an herbaceous groundcover with edible, showy, bright red drupes. An excellent book on the genus Cornus has been written by Paul Cappiello and Don Shadow, entitled “Dogwoods: The Genus Cornus” published by Timber Press in 2005. Another informative publication is “Dogwoods for American Gardens” by Willard T. Witte, Mark T. Windham, Alan S. Windham, Frank A. Hale, Donna C. Fare, Wayne K. Clatterbuck" https://extension.tennessee.edu/publications/Documents/PB1670.pdf University of Tennessee Agricultural Experiment Station, Knoxville, TN, 2002. Photos and a detailed description of each of the 19 taxa listed below can be accessed by clicking on the botanical name. The actual locations on five separate maps can be accessed by clicking on map name under the heading "Campus Location." A spectacular show of pink fireworks visually signals the arrival of spring in the Eastern landscape. Lacing roadside margins, fence rows, vacant fields, and woodland edges, the Eastern Redbud (Cercis canadensis) proudly shows off its jewel-like clusters of bright magenta blossoms in early April. The genus Cercis is indigenous to the warm temperate regions of the world, from North America to Europe and eastward into Asia. Surprisingly this genus occurs in two distinctly different environments. Our familiar, very local Eastern redbud inhabits the moist, deciduous forests of eastern North America and the five species of Cercis from China inhabit very similar environments. On the other hand, the western varieties of C. canadensis as well as those species inhabiting the eastern region of the Mediterranean and further east into Afghanistan have adapted to harsher, seasonally dry habitats, some bordering on almost desert-like conditions. Cercis, a member of the Pea Family Fabaceae, is a genus of single- to multi-stemmed, deciduous trees or large shrubs commonly known as redbuds. They are in most part characterized by simple, rounded to heart-shaped leaves and perfect, pinkish red, pea-like flowers that are borne in early spring on bare, leafless branches. The genus currently contains 8 accepted species (Plants of the World Online, Kew, 2019): Cercis canadensis, Cercis chinensis, Cercis chingii, Cercis chuniana, Cercis glabra, Cercis griffithii, Cercis racemosa, and Cercis siliquastrum. The genus name is derived from the Greek word kerkis meaning "weaver's shuttle" supposedly in reference to the resemblance of the seed pod to a weaver’s shuttle. Cercis canadensis is native to the USA and consists of four botanical varieties: var. canadensis, var. texensis, var. mexicana, and var. orbiculata. Each is indigenous to a specific geographic location and dependent upon a specific environment. Considered one of our most charming native trees where it grows abundantly from southernmost Canada, southward to northern Florida, and westward into Texas. Eastern Redbud is found in both open and shaded woodlands, along stream and river banks, and at woodland edges growing well in most soil types except wet. From tree to tree, flower color ranges most commonly from rosy purple to pinkish lavender and rarely to white. The pea-like flowers are ½” wide and are borne in clusters that may arise on any part of the tree, from the youngest twigs of the previous year to up and down the main trunk (a habit known as cauliflory). The flowers are edible and make an excellent addition to a spring salad. The new foliage is a waxy, purplish green that quickly turns to a softly shining, dark blue-green in summer, and then a clear bright yellow in fall. The thin-textured, alternate leaves are 3 to 5” long and have a uniquely appealing heart shape. Soon after flowering, 3-inch long, flat, pea-like, seed pods develop which persist into winter. Eastern Redbuds grow as small deciduous trees or as large shrubs reaching 20 to 30 feet high with a 25- to 35-foot spread. Their gracefully ascending and young, zigzagging branches form a flat-topped to rounded crown. The flowers provide an early spring source of pollen and nectar for bees and once pollinated, form leguminous pods which provide seed that is consumed by hungry birds. In the south leaf cutter bees, a productive pollinator for summer gardens and flowers, use the leaves to line their nests. Eastern redbuds also support the specialized bee, Habropoda laboriosa. Redbuds make attractive lawn trees. They are invaluable as specimen trees in smaller gardens and just as lovely naturalized through the forest understory or at its edge. They certainly have their place in shrub borders and even foundation plantings. Most redbuds provide shade if limbed up or serve as a screen if low branches are kept. In winter the dark, leafless, zigzagging branches display an attractive silhouette, especially effective against a light-colored wall. Larger forms make appropriate small shade trees for patios and courtyards. Do any pruning in the dormant season or preferably immediately after bloom. Unfortunately leaf anthracnose, dieback, and Verticillium wilt can be significant disease problems in our native species. Provide good growing conditions by siting in full sun to dappled shade in fertile, moist but well-drained, woodsy soil. Choose a site carefully as plants don't like to be moved. Although adaptable to acid or alkaline soils, redbuds are sensitive to salt and ozone. Cercis canadensis is hardy in USDA Zones 4 to 9. Since this redbud varies in hardiness dependent upon provenance, gardeners in the coldest regions, i.e., Minnesota, should plant a redbud of local origin. The Texas Redbud has a very glossy, thick-textured leaf which makes it more sun-tolerant and also more drought-resistant. It is most commonly multi-trunked, reaching 20 to 35 feet high with a spread of 15 to 25 feet. The Texas redbud can be found growing on thin, calcareous, well-drained soils west of the eastern redbud's native habitat in Oklahoma and Texas. Hardy in USDA Zones 6 to 9. This variety was formerly known as Cercis reniformis. The shrubby Mexican Redbud is found further west of var. texensis, growing in dry washes throughout the Chihuahuan Desert of southern Texas and northern Mexico. It too is multi-stemmed, smaller in stature (10 feet tall and 15 feet wide) with smaller, glossier leaves, and is more drought tolerant than the Texas redbud. More often than not, the leaf blade of var. mexicana exhibits an undulate margin where the leaf blade of var. texensis is typically flat. Hardy in USDA Zones 6 to 9. The Western Redbud, formerly known as Cercis occidentalis, is native to the foothills of California, Arizona, and Utah where it flourishes with little water. The leaves are more rounded at the tip when compared to the relatively heart-shaped leaves of the Eastern Redbud, however it does display the typical pea-like shape and magenta color of its flower, blooming in early to mid-spring. Fully grown Western redbuds typically reach 10 to 20 feet tall with a spread of 10 to 15 feet and are most often grown as a small, multi-trunked tree or shrub. Hardy in USDA Zones 7 to 9. Cercis chinensis, the Chinese Redbud, is popularly cultivated as an ornamental in the USA. It is hardy in USDA Zones 6 to 9 and performs particularly well in the southeastern parts of the country. This tree will grow to as much as 50 feet tall in its native habitat of central China, but under cultivation in the USA, it usually grows as an open, densely branched, multi-stemmed shrub or small tree reaching only 8 to 15 feet tall. It is somewhat similar in appearance to our Eastern redbud however Chinese redbud has larger, bright rose-purple flowers, glossier leaves, longer seed pods, shorter mature height, variable but usually less attractive fall color, and lesser winter cold hardiness. The Chinese redbud also seems to be less affected by the common diseases and pests of our native redbud. It grows best in moist, but well-drained, loamy soil and dislikes dry soils and heavy clays. Since the tree develops a long tap root over time, it makes transplanting of established trees difficult. Another Chinese species of redbud is Ching’s redbud, Cercis chingii, notable for its thick, leathery leaves and thick-walled, dehiscent seed pods while other redbuds possess indehiscent fruits. (Dehiscent fruits crack open along two seams and shed their seeds into the environment when the fruit is ripe.) It is the earliest redbud to flower; the inflorescences are pink and are similar to most other redbud blossoms. Due to its lax branching habit, Ching’s redbud sprawls and forms broad mounds that will reach 10 to 15 feet in height. Cercis chingii is hardy in USDA Zones 7 to 9. Also distinctive is a group of Chinese species that are characterized by flowers that are borne on elongated racemes, as opposed to the sessile, umbel-like clusters typical of most other redbuds. This group includes the chain-flowered redbud, C. racemosa, the Yunnan redbud, C. glabra, and the Guangxi bauhinia, C. chuniana. Of the raceme-bearing redbuds, Cercis chuniana is further distinguished by virtue of its ovate-rhombic leaves with somewhat asymmetric tapered bases. It is the redbud species with leaves most different from the heart- or kidney-shaped leaves of most other species. All are hardy in USDA Zones 7 to 9. Commonly known as Judas-tree, Cercis siliquastrum is often a multi-trunked, understory tree with a rounded crown that typically matures to around 15 to 25 feet tall. This tree is native to woodlands in the Mediterranean region extending from southern Europe to western Asia and is hardy in USDA Zones 7 to 8. It performs well in the warmer areas of the USA. In early spring Judas-tree is covered with a profusion of magenta pink flowers which appear before the foliage. The matt green leaves are heart-shaped with a leaf surface that is characteristically undulating and the long-lasting flowers are larger than those found on most other Cercis species. The flowers have an acidic taste and are often eaten in mixed salads or made into fritters. The Judas-tree was frequently included in the 16th and 17th century herbals. There are two possible derivatives as to the origin of the common name. Either the tree is said to be the one from which Judas Iscariot hanged himself after betraying Christ, or the name may derive from the regional name "Judea" encompassing Israel and Palestine where the tree is commonplace. Growing further east of the Mediterranean region is a rare and little known redbud commonly known as Afghan or Griffith’s redbud, Cercis griffithii. It is yet another multi-stemmed shrub with an upright habit reaching 15 to 20 feet tall. It inhabits dry forests and rocky soils and is found along the southern borders of Tajikistan and Uzbekistan of Central Asia, eastward into Afghanistan, and perhaps also into Pakistan and India. Some botanists prefer to interpret the Afghan redbud as merely the easternmost extreme form of Judas-tree. It is only occasionally cultivated as an ornamental. Griffith’s redbud is hardy in USDA Zones 7 to 9. Redbuds possess incredible genetic diversity and therefore offer numerous possibilities for genetic improvement as well as the development of new ornamental types. The range of cultivars associated with Cercis canadensis is remarkable and ever expanding. In the past number of years, breeders have introduced a number of exciting new cultivars involving both our native redbuds and as well as the Asian species. The U.S. National Arboretum began a redbud breeding program in the 1960s with the intent to develop cultivars with longer flowering racemes, more colorful foliage, unusual flower color, adaptability to the environment, and resistance to disease. The J. C. Raulston Arboretum of North Carolina State University soon followed in 1978 with their breeding program. The Arboretum's collection of redbuds is one of the most comprehensive in North America and in 2008 the collection was recognized by the North American Plant Collection Consortium (NAPCC) and officially designated a national collection. J. C. Raulston Arboretum currently holds seven species and 40 distinct taxa. Some lesser known species also offer useful characteristics in the hybridization of Cercis, such as the pendulous flower clusters of C. racemosa and the canker resistance of C. glabra. 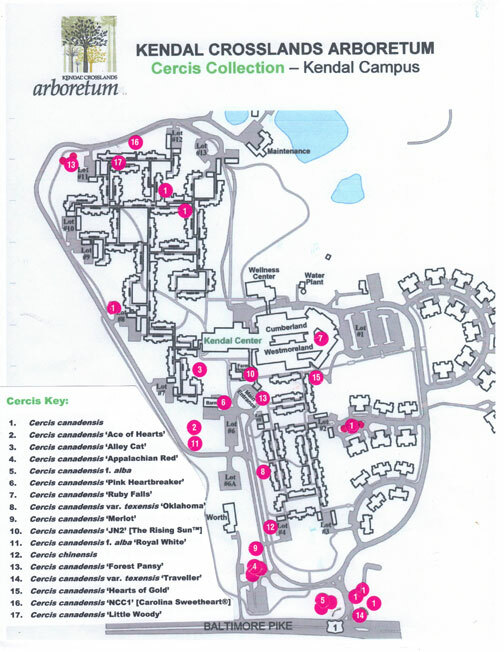 The Cercis Collection of the Kendal Crosslands Arboretum is located on the Kendal Campus. Currently there are 32 trees representing 2 species and 17 taxa. A detailed description of each of the 17 taxa is listed below.